How to avoid spectacle losing frustration – Craft-a-licious . . Unfortunately I find myself relying more and more on spectacles (damn it! ), but can never seem to find the buggers when I really need them. I recently went out and bought 6 pairs of magnifiers and spread them all over the house thinking smugly to myself that I was super clever. Wrong. Again. Somehow they started on a composting journey beneath layers of papers, yarn, books etc. until I was down to 2 pairs which were relatively easy to find. Then 1 day both pairs finally disappeared. Damn again! I-cord, the quick and easy grown up version of the ‘french knitting’ I used to do on a cotton reel with 4 nails hammered in one end. Never did know exactly what to do with resulting round knitting, but always liked seeing the tail emerge from the cotton reel. Finally, something with purpose can be done with it! Thank you to who ever thought this I-cord technique up. This is what you do to help prevent spectacle losing frustration. 1. Knit about 68cm-70cm of I-cord, leaving a 20cm tail at either end. Depending on yarn weight, I used 3 stitches on thicker yarn and 4 stitches on thinner yarn. 2. Thread a bead on the tails at either end, then thread a glasses keeper (black o-ring with wire wrapped around the middle) after the bead. 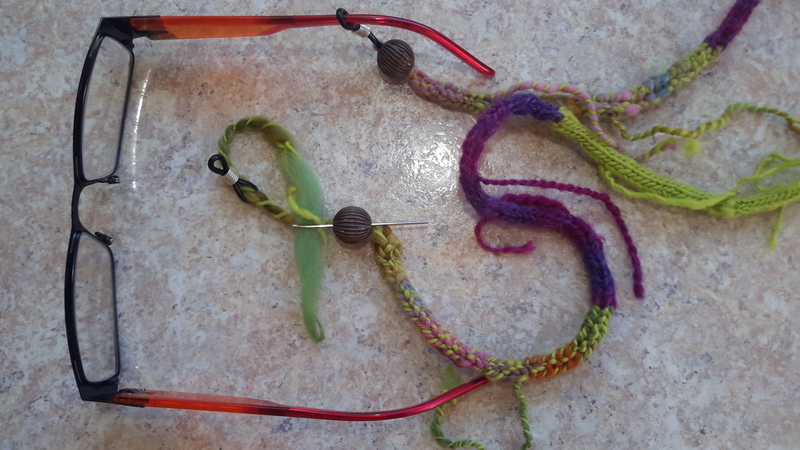 Thread the yarn back though the bead and into the knitting for the glasses keeper and bead to stay put. Do same on other end. 3. 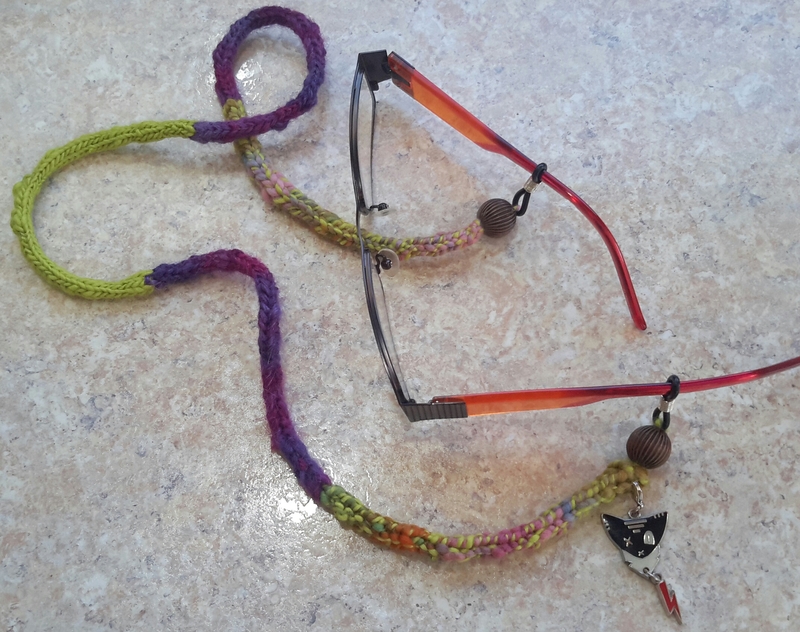 Place arms of glasses onto the neck cord you have just made. Add a mobile phone accessory beneath one bead to show you are cool and not an old fart wearing a glasses neck cord. There aren’t many things I make that are either quick OR useful, so I have really extended myself here … (pats self on back).